I am very lucky to have a husband who humors me in the lunch-making category. He'll take any shaped food, any picks, any designs, any boxes with nary a complaint. It does make things a lot easier when I'm trying to get something blogged and the kids have already eaten. He called me the other afternoon and asked if I could bring him lunch, so I did. He had pastrami and cheese sliders on the little Hawaiian rolls, with lettuce, tomato and mayo. Since they were a bit thick, I used a few of my long heart picks to hold them together. 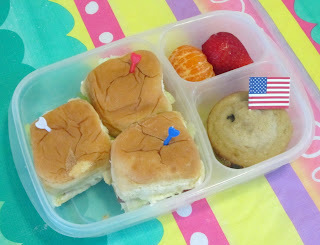 He had the last of the Cutie oranges, a nice big strawberry to fill the space, and the last of the blueberry cinnamon muffins, which I had to decorate with a spare flag pick. Lunch is packed in our Easy Lunchboxes for convenience and the cooler.